Watch Mystery Pre Baselworld 2013 by Konstantin Chaykin.Konstantin Chaykin starts the year with a new series of watches Mystery that will lead to Baselworld 2013. Konstantin Chaykin starts the year with a new series of watches Mystery that will lead to Baselworld 2013. Previews for the ladies, assemble all the Calibre manufacturing KMR 03-1. New colors and new materials such as mother of pearl, coral, jade and amethyst come to life on the dials of watches new Mystery Levitas. All new collection for women is characterized by designs that are inspired by the sun, sea and sand. 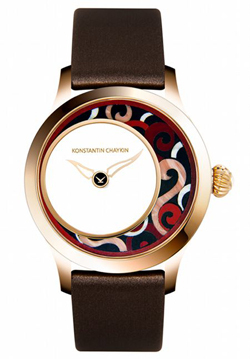 Each watch is unique: Konstantin Chaykin creates a single pair of each model, one with a stainless steel case silver, the other in rose gold. In Levitas Pearl rays of the Sun around the transparent window. This women’s watch-rays are used to mark the time. Front covered with natural mother of pearl, its skeleton hands move as mysteriously suspended in the air. Lapis lazuli, turquoise and amethyst stones Levitas Marine surround the central transparent portholes as the waves caress the beach in the middle of the night. The semi-precious stones are expertly combined with Florentine mosaic – complicated technique used by the most skilled jewelers. The bezel and lugs are encrusted with small diamonds. The ladies watch Levitas Red Coral accompanies those who wear the wrist in a mysterious underwater journey punctuated by shades of red coral and jade dark. The decorations made of jade and coral are made using the technique of Florentine mosaic and skeleton hands seem to float mysteriously in the large transparent window. The Levitas Lily for women is another masterpiece of mysterious Konstantin Chaykin. 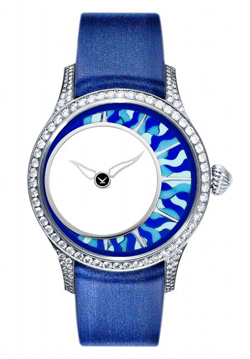 Both timepieces are embellished with soft white lilies in Florentine mosaic symbolizing purity, beauty and hope. The lilies are in agate calmucca arranged on a background of jade and malachite. BONUS: pictures live from Baselworld Konstantin Chaykin Mystery (pre series). The archives of the last edition of the Salone some photos from the archive of Class Watches taken at the booth of Konstantin Chaykin at area independent watchmakers AHCI. It ‘a studio site in St. Petersburg specialized in wrist watches Haute Horology and mechanical movements of large caliber. Konstantin Chaykin is a famous Russian watchmaker and inventor of patented inuove complications. Prior to the exhibition Moscow Watch Expo 2011 left no time!